Suitable for extensive industrial usage, our Engineering V-Belts are of unmatched standards. We fabricate them using the latest CAD/ CAM technologies. Therefore, our entire range is structurally reliable, dimensionally accurate, excellently finished and durable. 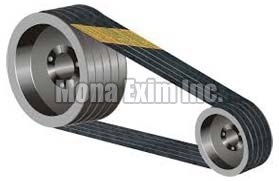 We provide Engineering V-Belts in various designs and sizes to meet varied requirements of buyers. In addition, we offer customized solutions. Buyers can get Engineering V-Belts from us anytime and expect on time delivery of consignments.